Winner of several prizes in international competitions, Sébastien VACHEZ is a concert artist, composer, arranger and teacher. Sébastien Vachez was born in France in 1973. His father took charge of his first musical steps when he was four years old. Three years later he is enrolled in the "Conservatoire National" in his native Troyes. His first guitar instructor was JeanPierre Chauvineau. Pierre Goliot followed up the remaining years of his musical apprenticeship there, culminating with the professional diploma. At the same time Sébastien studied the important complementary musical disciplines such as harmony, musical analysis, chamber music, etc. Afterwards he carried on his musical studies in Paris with Vladimir Mikulka and Gérard Verba. During the same period Vachez took part in master classes with wellknown guitarists such as Roland Dyens, Roberto Aussel, Arnaud Dumond, Tania Chagnot, Pablo Marquez, Aniello Desiderio, Zoran Dukic and others. Winner of several prizes in international competitions, Sébastien VACHEZ is currently leading a career as a concertist, composer, arranger and teacher. He is certainly no stranger to the platform of international festivals having performed in many european countries (Spain, Portugal, Italy, Germany, Sweden, Norway, Poland, Hungary, Croatia, Greece), in South America (Peru) and in Asia (Hong Kong). As a teacher, he frequently appears in master-classes and workshops. 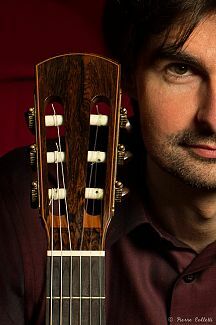 Sébastien has also recorded six CD (“Comme une Saudade”, “Cuba Libre”, “Couleurs Tango”, “Brésils”, “Valsez sur moi” and “Chamber Music”) and his own works are regularly published by Doberman-Yppan (Canada), d’Oz (Canada) and Henri Lemoine (Paris). His compositions are played and recorded by the greatest musicians from all over the world such as Shin-Ichi Fukuda (Japan), Thibault Cauvin, Olivier Pelmoine (France), Boris Gaquere (Belgium), Dimitris Dekavallas (Greece), Kevin Manderville (USA), Matthew McAllister (Scotland), Sébastien Deshaies, Isabelle Héroux (Canada), etc.